Tooth jewellery is one of the latest fashion trends to add an extra sparkle to your dazzling smile, using gems or jewels. A lot of designs in different sizes and colors are available to choose from . Also designs can pick depending to suit your style and personality. 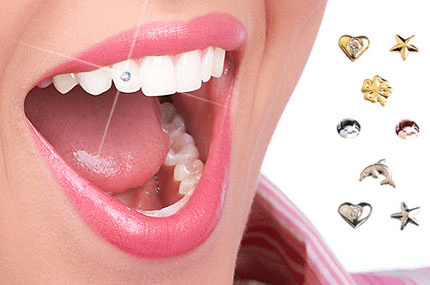 In addition tooth jewellery is an excellent way to give your smile added radiance and glamour. You can use it for night parties and other occasions to smile with richness. Swarovski crystals, gold, titanium and metal alloys are used to create your unique smile.